May as well just find flash games online to be honest, isn't much here worth buying. They're damn cheap though, no denying that. The Tiny Bang Story was fun when I played it (on my iPad). Really good music too. There is a reason these games cost pennies. Is it cos theres a sale on? Gearcrack Arena is the best game on there by far! Read as far as Bad Rats and figured this wasn't going to be up to much. 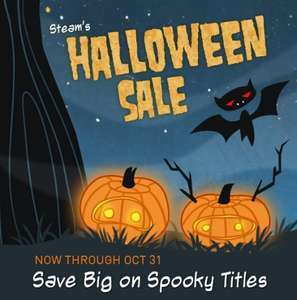 I've kind of come to expect better from Steam sales on big annual dates like Halloween although now I'm writing that down I realise it sounds fairly over entitled. Painkiller is well worth 50p! They probably have been..... for 60p lol. Don't be quick to jump to conclusions based on price alone. Some of these games look quite fun, and many have very positive reviews too.